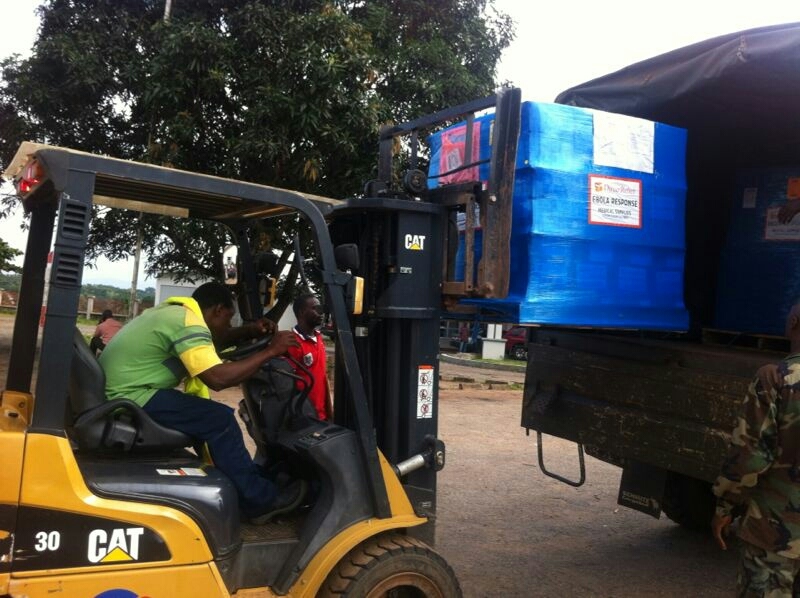 Emergency supplies to protect health workers in Ebola hot zones arrived in Sierra Leone this week and are en route to Direct Relief’s partner Medical Research Centre in Freetown, Sierra Leone. The shipment – valued at nearly $40,000 – contains more than 5,000 pounds of urgently needed protective equipment like gloves, masks, goggles, and gowns to help prevent health workers from contracting the virus, which is spread through contact with infected bodily fluids such as blood, sweat, and saliva. In responding to the Ebola epidemic, it is particularly important to keep health workers safe as losing them carries tragic implications not only for the ability to contain the virus outbreak, but also for the future of the country’s health system. Sierra Leone has less than 150 doctors for its six million people, reports Reuters. This is the tenth emergency shipment of Ebola aid supplies sent to West Africa since the current outbreak – the deadliest in history – began this spring. Urgent requests from health partners continue to come in and Direct Relief is currently preparing more shipments for the affected region. As of August 31, more than 1,100 cases and 430 deaths had been confirmed in Sierra Leone, according to the World Health Organization. Join the fight against Ebola. Help airlift more shipments like these when you donate here.